My favorite chapter described what Goldstein referred to as Reasonables and Unreasonables. Reasonables believe that basically the universe makes sense and we can figure out what these laws are if only we are attuned enough. They believe that knowledge is constructed out of experiences and reasons that can be replicated by other people. Unreasonables believe that experiences of the universe can be unique and ineffable, that intuitive knowledge goes beyond what we can describe or defend and is still valid. This is the most definite difference she drew between Socrates and Plato. Socrates believes in a daimon who sends him a warning when he's about to do something wrong. Plato, on the other hand, is very much a Reasonable. The biggest drawback for me was that the logic of the narrative flow was difficult to follow. Goldstein claims that the project of the book is to unravel Plato the man from his doctrine and his craft. These are both difficult tasks since he hides behind the voice of his teacher, Socrates and relies so heavily on the technique of irony. One of my favorite parts was a Myers-Briggs profile that Goldstein filled out for Plato and what I thought was the best demonstration of her research into what Plato the man was like. (Myers-Briggs is a personality test based on Jungian psychology. But it almost seems like Goldstein has such a difficult time finding enough material about Plato himself, that she fills up with other vaguely related material. The book is organized in an alternating sequence so that one chapter will describe the historic setting of Plato's life in Ancient Greece and the next chapter will be a fictional dialogue with Plato jettisoned into present day and leading intellectuals of the time. Some of these fictional characters overpower Plato. I found it especially irksome when one of the characters jumps in to respond in Plato's stead. Don't we want to be hearing from Plato? I tried to follow the logic of the flow between chapters and only realized in the second to last chapter not only did the historic chapter inform the next dialogue, but the dialogue also informed the next historic chapters. Unfortunately, the author seems to write intentionally vaguely. In a chapter about Socrates, she only refers to Socrates as "he" except for the chapter heading. I'm not sure what the point of this vagueness is. Another chapter is about Alciabiades, Socrates' spurned lover. I can understand writing about Socrates when writing about Plato since the two are intertwined, but writing about Socrates' (rather than Plato's) lover seemed to be one step too removed to make sense to me. The book begins by discussing the relevance of Plato's ideas and the dialogue that follows debates the value of expertise versus crowd-sourcing. The next pairing is the development of virtue leading to a discussion of parenting. We meet Alciabiades amidst an exploration of eros paired with a love advice column. The question of mortality and immortality is with the value of a person's degree of influence. And what counts as justified true belief is paired with the question of free will and determinism as demonstrated by the brain. To further pair a drink with this book, the obvious one is Hemlock even though that more directly relates to Socrates than Plato. 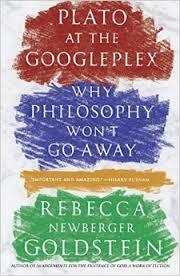 But as this book demonstrates, perhaps it is impossible to untangle Plato from Socrates. Socrates was found guilty of corrupting the youth and refusing to recognize the gods recognized by the State. I recommend not trying this drink unless you are very comfortable with your own mortality. If you want something slightly less poisonous and more modern, you can always try Ouzo which is a Greek anise-flavored liquor. Plato would not have drunk it in his day, but maybe he would have enjoyed it during his exposure to the modern world.